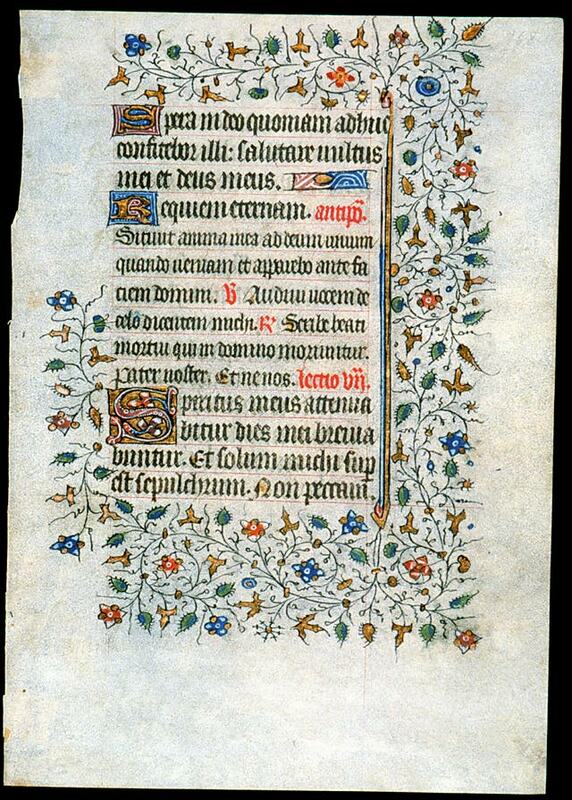 Text: This leaf contains text from the Office for the Dead, Matins, the third Nocturne. A scan of the verso is not currently available. Spera in Deo, quoniam adhuc confitebor illi: salutare vultus mei, et Deus meus. Requiem eternam. Antiphon. Sitivit anima mea ad Deum fontem vivum: quando veniam, et apparebo ante faciem Domini? V. Audivi vocem de celo dicentem michi. R. Scribe beati mortui qui in domino moriuntur. Pater noster. Et ne nos. Lectio vii. [from Psalms 41] Hope in God, because yet will I confess to him: the salvation of my countenance, and my God. Give them eternal rest. Ant. My soul hath thirsted after God the living fountain, when shall I come, and appear before the face of our Lord? V. [ ] R. [ ] Our father. And lead us not. Lesson 7.